Make the black bean salsa: in a bowl, combine the tomatoes, onion, garlic, cilantro, chili, and cumin. Add the beans and salt and pepper to taste. With a sharp knife, cut each lobster tail in half lengthwise and loosen the meat, keeping it in the shell. Make the garlic butter: cream the butter in a bowl, add the garlic, oregano, and salt and pepper to taste, and mix well. Spread half of the butter mixture over the lobster meat. Place the lobster under the broiler, 4 in (10 cm) from the heat, and broil for 5 minutes or until slightly browned in patches and heated through. Spread the lobster with the remaining garlic butter and then garnish with lime twists and cilantro sprigs. 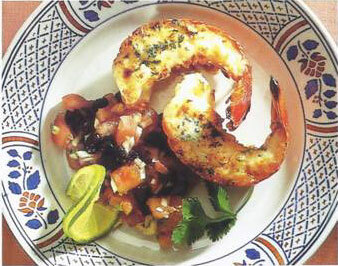 Serve the lobster immediately with the black bean salsa. Substitute refried beans Jar the black bean salsa. Heat 11/4 cups (375 g) canned retried beans with a little water, and 1/4 tsp each ground cumin and chili powder, then lightly sprinkle with grated Cheddar cheese. Proceed as directed.